Before starting a home renovation project it’s best to check if your home is capable of handling it. One aspect to check before starting your renovation project is your home’s wiring, which can be easily damaged by a new renovation. Keep an eye out for flickering lights – Flickering lights may indicate you have a wiring problem. First, make sure the bulb is properly screwed in as this may rectify the problem. However, if the problem persists and there is nothing wrong with the bulb, then there might be something wrong with the wiring. Examine discolored or charred outlets and switches – Discolored or charred outlets can be a sign of a serious problem. A charred outlet means your outlet is severely overloaded and is causing intense heat, which can lead to a fire breaking out. Look for frayed wiring – Frayed wiring isn’t necessarily wires completely falling apart. Frayed wires can still be dangerous even if a small piece of wire insulation is missing. Any fraying wires should be immediately replaced to reduce chances of a fire starting. You notice your circuit breaker trips frequently – Your circuit breaker’s job is to prevent fires by “tripping” or cutting off electrical flow when a circuit exceeds the number of amps it’s designed to handle. If you notice it’s tripping more often than usual, you may have faulty wiring. You notice a burning smell unrelated to burning or cooking food ­– Noticing a burning smell without an identifiable source can be troubling. Signs of electrical fires typically have an acrid smell. If you notice the smell is coming from an outlet don’t hesitate to call a repairman. While you may feel like you can handle repairing or fixing your wiring by yourself, it’s best to leave it to the professionals to prevent damage to your home and to yourself. 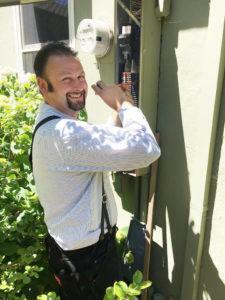 Bonney Plumbing can solve your electrical wiring woes with our electrical repair services. We’re Sacramento’s five-star home electrical repair company, providing reliable, experienced and certified premier electricians. Bonney Plumbing’s certified premier electricians can also conduct a home electrical system inspection and recommend energy-efficient solutions for your home to save you money. Contact Bonney Plumbing to schedule an on-site consultation with one of our experienced electricians to help jumpstart your home renovation project today!